I'm sure you are in the midst of a busy show season like we are. This is the time of year that makes all the hard work of breeding and hatching and grooming worth the effort! We don't have a lot of updates and changes this issue, but we do have a special guest article about the importance of probiotics from one of our sponsors, Gro2Max. If you've never used or considered probiotics, learn a lot of great information in the article after the updates below. Probiotics are a dietary supplement that increase the population of beneficial bacteria (microflora) that are vital to a healthy digestive system. The use of probiotics as a daily supplement has become more widespread as the benefits have become more evident. Studies on various probiotic strains show an increasingly wide array of health benefits, contributing to overall animal population health, environmental sustainability and improved farm economics. Naturally-occurring enzymes are typically lost in feed processing, and probiotic elements should be added to feed or drinking water on a regular basis. Doing so, especially with chicks, ensures optimal digestive system development and a steady supply of gut microflora throughout later life stages. This also helps to maintain a strong immune system, leading to reductions in mortalities and less frequent need for harsh antibiotic remedies. While regular use of probiotic supplements is recommended, some poultry keepers choose to add probiotics to the feed regimen during particular occasions. For show birds, probiotics help to ward off illnesses that might be contracted in the show environment. During breeding and showing, stress can lead to vulnerable immune systems and increased likelihood of disease, which can be prevented by probiotics. During antibiotic treatments, probiotics replenish the good bacteria that is eliminated by medications, and help to shorten the recovery period. When digestive ailments arise, probiotics help to quickly re-establish digestive balance. The benefits of probiotic supplementation are numerous. Customers who have used our company's supplement, Gro-2-Max, have reported positive results in reversing conditions such as vent gleet, broodiness and worming treatment side effects. In vitro test results with broilers have shown significant weight gain improvement, which farmers have also reported after using the product. Layers have been shown to produce larger, better-quality eggs. For production farms and hatcheries, the added expense of probiotic supplements is eclipsed by the savings and increased revenues that result from enhanced feed conversion efficiency (probiotics help improve nutrient absorption), reduced mortality rates, improved growth and egg production. It should be noted that not all probiotics are the same. While just about any product with a single strain of bacteria in the ingredients list can call itself a "probiotic," it is important to make sure there are more than just one or two strains in the formula. Each strain of beneficial bacteria will perform a different function, and a variety of strains will help to achieve more well-rounded results. 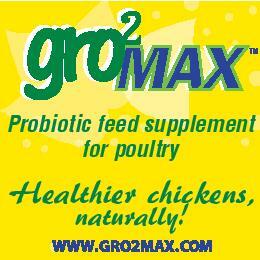 For the Gro-2-Max formula, five strains were chosen based on proven efficacy with regard to digestive and immune system improvement. Studies are ongoing in this promising area of biotechnology, and the multitude of benefits to probiotic use is certain to grow in the future.